A travel set featuring the espresso machine for your car, the Handpresso Auto Travel Set has everything you need for brewing on the go. 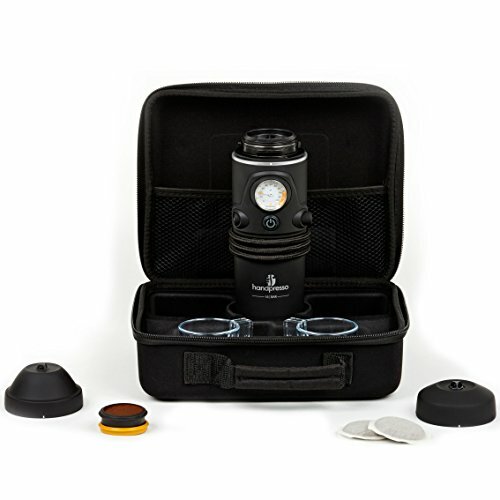 Housed within the black travel case you'll find a Handpresso Auto Hybrid Espresso Machine, two Unbreakable Espresso Cups, and a branded Handpresso towel. The case, which measures 10.3" x 8.3" x 3.7" is compact enough to tuck away neatly in your car, but spacious enough to house the included machine and accessories with space left over for your ESE (easy serve espresso) pods and other essentials. If you have any questions about this product by Handpresso, contact us by completing and submitting the form below. If you are looking for a specif part number, please include it with your message.